HAPPY NEW YEAR EVERYONE!!! I hope you all had a wonderful time w/family & friends over the holidays and also managed to keep active. I did a few 5K's, NTC workouts and worked on my yoga. I found this really helpful site Yoga Journal that has videos from beginner to advanced to help me master some moves. 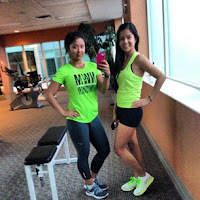 My first day off I enjoyed a 5K run w/my little sister. 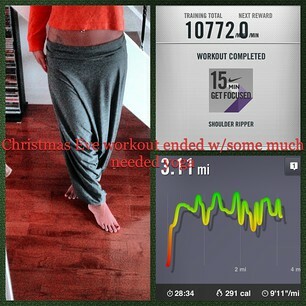 Christmas Eve another 5K, with some upper body workout & ended w/some much needed yoga. hehe like my harem pants? Dec 29 - 5K in 8cm of snow WHAT! Yup I ran in the snow and it was exhilarating! There is no better feeling than hearing the ice and snow crack beneath your feet as you motor along. So I thought I'd share some tips on running in the snow. Let people know where you're going, and how long you're going for. If you get stuck somewhere or fall, it will be nice to know that people will be looking for you or simply run with your phone. Snow is great for resistance training, try finding some deep snow on a level surface and sprinting through it. Dress in layers, start with a sweat wicking base layer, DO NOT wear Cotton as this will soak up moisture and keep you wet=cold! Then on top of the base layer go for a Gore-Tex material jacket or windbreaker. If really cold get a fleece type middle layer on. Get some lip balm on! Finally, you cant beat that feeling of being out there when everyone else is curled up in front of the TV, that’s one of the best things about running through winter, the feeling that your doing something not many people would like to. Oh and don't forget to make sure you've got some nice hot soup or hot chocolate to come home to for a quick recovery/warm up. awesome!! I love the harem pants! great tips! does your family all live near you? you are lucky if so... it was so nice to have our family here over holidays. sad to see them go. Thank you :) I got the pants in Paris. Yes, my immediate family are all nearby. Aww that's what makes the holidays special, being able to cherish the time together.